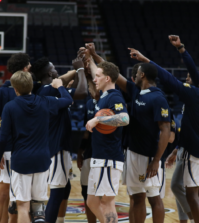 In its first home game since the heartbreaking loss against Robert Morris in the NEC Championship, the Quinnipiac men’s basketball team was involved in another thriller at the TD Bank Sports Center. This time it had a better ending. 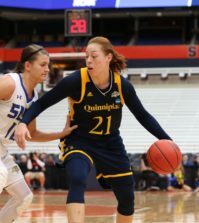 Behind James Johnson’s 23 points, Quinnipiac (2-0) defeated the University of Hartford (0-2) 66-64 in the Bobcats home opener on Tuesday night at The Bank. The Bobcats held a comfortable lead for most of the game, but a 7-1 run by the Hawks late in the second half narrowed the score to 61-60 with 1:46 remaining. But Johnson responded hitting a three-pointer with 1:16 remaining to give the Bobcats a 64-60 lead. 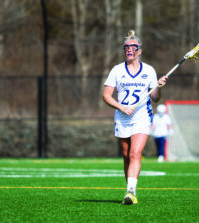 “When the team needed a big shot I’m always there to step up and I just knocked it down,” Johnson said. The Hawks climbed back to within one point behind two key layups from their leading scorer Morgan Sabia with 20 seconds left in the game. After Dave Johnson hit one of two free throws, Hartford held on to take the last shot, but Milton Burton’s three-pointer at the buzzer was no good. Quinnipiac freshman Dominique Langston finished the game with 12 points and seven rebounds, hitting some key shots in the second half. “It’s nice to get a game like that out of a freshman. He’s a real high IQ player and he showed some moxie out there tonight for his first home game as a college player,” Moore said. Justin Rutty was contained most of the game by Hartford’s 1-3-1 defense, but still registered a double-double scoring 10 points and grabbing 12 rebounds. Deontay Twyman had 11 points and was 3-for-6 behind the arc. The Bobcats had a dominant first half, shooting 56 percent from the field and 55.6 percent from beyond the arc. However, they could not duplicate that success in the second half, shooting 23 percent from three-point range and 31 percent from the field. Before the game, the Quinnipiac unveiled its 2009-2010 NEC regular season championship banner, commemorating last season’s success. The Bobcats return to the court on Nov. 20 when they face the University of Vermont at the TD Bank Sports Center at 3:00 p.m.